The latest manufacturer to enter the already crowded netbook arena is OEM hardware maker OCZ, with the launch of their first netbook, the OCZ Neutrino. The OCZ Neutrino will come with a 10 inch LED backlit LCD display with a resolution of 1024 x 600, memory comes in the form of 2GB, and of course processing comes from the now industry standard Intel Atom N270 1.6GHz processor. 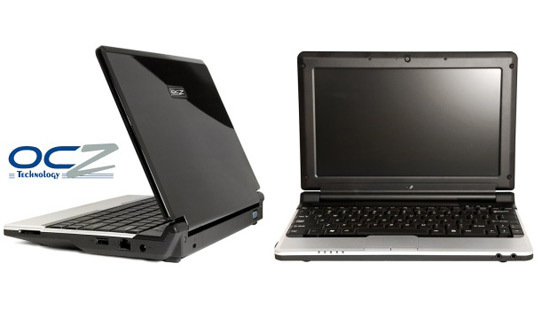 The basic model comes with a 250GB hard drive, but there is also the option to have a 250GB SSD at an additional cost, on top of that there is built in WiFi, Ethernet, a 1.3MP web camera and a 4-in-1 card reader. The OCZ Neutrino will come with either am choice of Windows Xp or Linux, there is no word on pricing or availability as yet.